Out of many semiconductor controlled devices, MCT is considered to be the latest. The device is basically a thyristor with two MOSFETâ€™s built into the gate structure. 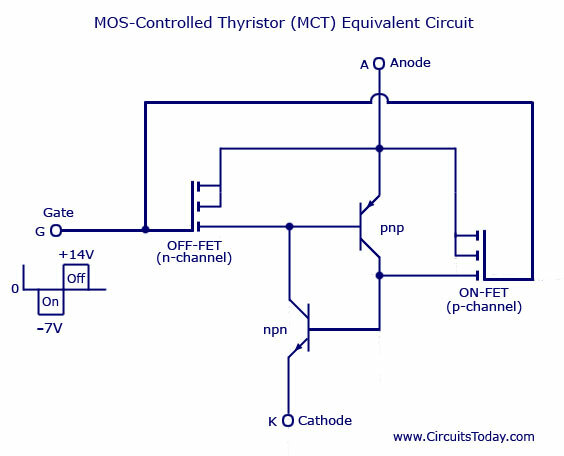 A MOSFET is used for turning ON the MCT and another one is used for turning it OFF. The device is mostly used for switching applications and has other characteristics like high frequency, high power, and low conduction drop and so on. 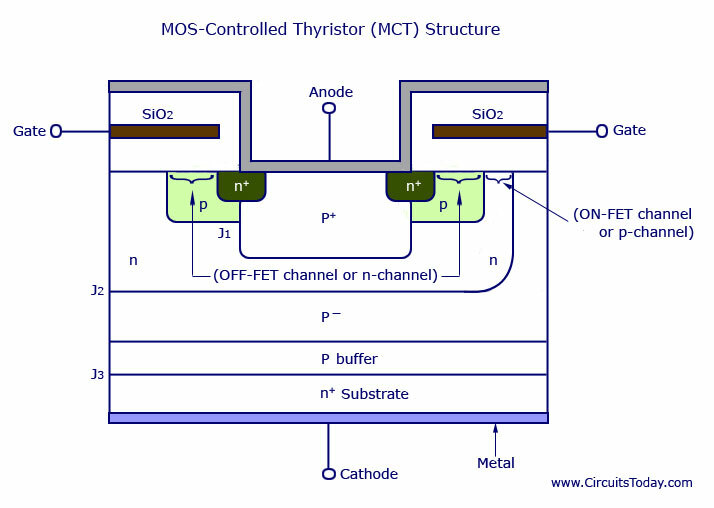 An MCT combines the feature of both conventional four layer thyristor having regenerative action and MOS- gate structure. In this device, all the gate signals are applied with respect to anode, which is kept as the reference. In a normally used SCR, cathode is kept as the reference terminal for gate signals. The basic structure of an MCT cell is shown in the figure below. In practice, a MCT will include thousands of these basic cells connected in parallel, just like a PMOSFET. This helps in obtaining a high current carrying capacity for the device. Â The equivalent circuit of the MCT is shown in the figure below. It consists of an ON-FET, an OFF-FET and two transistors. The MOS structure of the MCT is represented in the equivalent circuit. It consists of one ON-FET, a p-channel MOSFET, and an OFF-FET. Both n-p-n and p-n-p transistors are joined together to represent the n-p-n-p structure of MCT. An n-channel MOSFET is represented by drawing the arrow towards the gate terminal. A p-channel MOSFET is indicated by drawing the arrow away from the gate terminal. The two transistors in the equivalent circuit indicate that there is regenerative feedback in the MCT just as it is an ordinary thyristor. 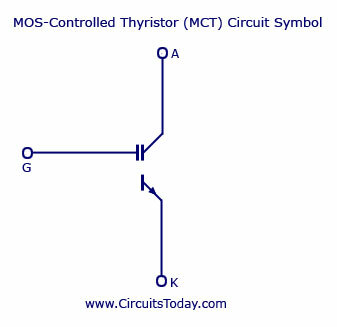 The circuit symbol of MCT is shown below. The device is turned ON by a negative voltage pulse at the gate with respect to the anode. For turning ON MCT, gate is made negative with respect to anode by the voltage pulse between gate and anode. So, MCT must be initially forward biased, and then only a negative voltage be applied. With the application of this negative voltage pulse, ON-FET gets turned ON whereas OFF-FET is already OFF. With ON-FET ON, current begins to flow from anode A, through ON-FET and then as the base current and emitter of n-p-n transistor and then to cathode K. This turns on n-p-n transistor. This causes the collector current to flow in n-p-n transistor. As OFF FET is OFF, this collector current of npn transistor acts as the base current of p-n-p transistor. Subsequently, p-n-p transistor is also turned ON. If both the transistors are ON, regenerative action of the connection scheme takes place and the MCT is turned ON. The device is turned OFF by applying a positive voltage pulse at the gate. The positive voltage pulse causes the OFF-FET to turn ON and ON-FET to turn OFF. After OFF-FET is turned ON, emitter based terminals of p-n-p transistor are short circuited by OFF-FET. So, now anode current begins to flow through OFF-FET and thus base current of p-n-p transistor begins to decrease. The device has the disadvantage of reverse voltage blocking capability. Will you please tell the manufacturers of MCT. I found Harris Semiconductor, But All parts are obsolete/Disconnected. Where do you obtain one of these? I can’t seem to find any manufacturer who still produces them. Thank you for informing us about the latest MCT. I would like to know if I can use MCT as “ac switch” for my design of multi-tap winding AVR. In replaced to mechanical relays. Can you please also provide sample circuit to drive this MCT from cmos 4000 series ic. Also I need the exact commercial part number of MCT for 400V 10A. I can’t find in RS.